The community garden is an organic garden. Organic practices must be used for planting, fertilizers, plant disease management, and pest control. The Thompson’s Station city workers till the soil, mow the lawns, and pump water to a tank from the nearby creek. The rest of the work at the community gardens are done by committed and passionate garden volunteers. $50 per FULL PLOT = $25.00 + $25.00 refundable deposit fee. Full Plot size is between 625 -750 sq ft (17×55). The $25 deposit is refundable if the garden plot has been maintained all year and cleared in late fall. The deposit can also be rolled into the next year. 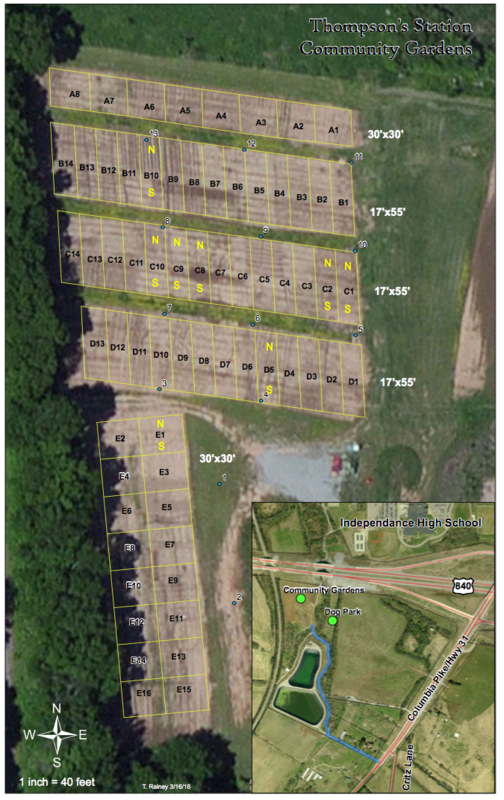 $30 per PARTIAL PLOT= $15.00 + $15.00 refundable deposit fee. Partial plot size is between 312-330 sq ft (17×27.5). The $15.00 deposit is refundable if the garden plot has been maintained all year and cleared in late fall. The deposit can also be rolled into the next year. *ALL participants must fill out this Google Form link for plot assignments. Plot assignments are assigned prior to payments and an email will be sent by April 1, 2016. *2015 past participants get first priority plot assignments when the Google Form is filled out and completed by March 15, 2016. *Participants shall volunteer to a minimum of 1 event (i.e. staking plots, hose inspections, burying irrigation lines, maintenance, clean up, etc). *New participants are recommended to garden a partial plot or 1 full plot to obtain community garden experience. *All plots are plowed and tilled with water to be available. 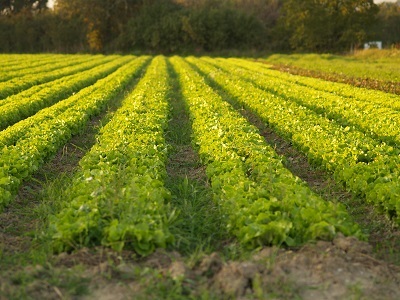 *Organic practices must be used for planting, fertilizers, plant disease management, and pest control. If using pesticides/insecticides must use organic approved pesticides/insecticides. *A participant waiver must be signed (see below) each season and sent to Town Hall with plot payment. DO NOT send checks until you have received a plot assignment. Send check or drop off at Thompson’s Station Town Hall AFTER you have received a plot location. *Item in red above are new in 2016. Accuracy of the water line location in Row D is off. One must count starting from D1 for accuracy. Items in Yellow that say N and S are divided in the middle as half plot locations. There is no physical marker to indicate the halfway mark in the plot.